We always welcome our Clients to share their vacation photos with us on our Facebook page Wallowa Lake Vacation Rentals. We hope you will share some from your trip too! LIKE us to keep up on specials, cancelations, contests, etc. Golden Saddle is a lovely home with beautiful views of the lake. It suited our needs perfectly which made our stay relaxing and enjoyable! Thank you! My family had a great President's Day weekend at Arapahoe Lodge. We have been to Wallowa Lake many times but this was our first trip there during the winter. We would highly recommend this place for anyone wanting a quiet getaway. This was perfect for two couples. It was very clean and cozy. We truly enjoyed our stay and will definitely be back. It was a great place to catch up with our friends and spend some quality time together! Your team is so wonderful, I talked to Jan, Cindi, and Jada. All so helpful and friendly. I will always go thru Wallowa Lake Vacation Rentals. I love the fact that it is family owned and that I can usually get ahold of a someone right away.So grateful for your family. My family and I had the most fabulous time staying at No. 40. The house was absolutely beautiful, the knotty pine thru out the home was so warm and inviting. We also loved the wood stove, so cozy! We cooked our 20 lb. turkey & had dinner with everyone around the table. We shared what we are grateful for and all agreed how fortunate that we could all be together at this time of the year! Again thank you! 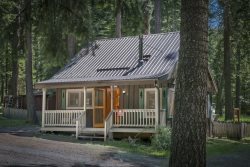 We all would highly recommend Wallowa Lake Vacation Rentals. Let me answer this way. We have already booked our next visit here . We were visiting for my daughters wedding and opted for this cabin over the lodge. We are extremely happy with our decision! It was beautiful, quiet, relaxing and we couldnt ask for a better location on the lake!! The views are breathtaking, and they really do think of everything to get your vacation started! It took us a bit to realize the thermostat on the wall actually controlled the gas stove, but this kept the entire house cozy warm! Would definitely rent the cabin again!! Only downside... wish we had a couple more days to stay! Your team is over the top. Efficient, helpful, pleasant. Staff really helped us out finding a locksmith when our keys were locked in the car as we were checking out. This AirBnB was an excellent choice for our October family reunion. It was homey which created a relaxing feeling and spacious for our 9 member family reunion. Very clean. Absolutely no complaints. Enjoyed getting to know the Wallowa area. Thank you. I have had trouble leaving a review on AirBnB so pass on any of these comments to possible. We had a wonderful stay in the "Time out" cabin. As tired parents it was our turn for a time out. It was quiet and peaceful. Hiking above the lake was beautiful in the Fall. Sitting in the hot tub looking at the stars, coming in to a warm fire...Loved every second. Will definitely be doing this again. Thank you so much! Beautiful view, quiet, and relaxing. Good to be at lake just after the big season. Definitely a way to unwind from the big city. Loved the Cinnamon roles from Sugar Time Bakery. Warm and alot of maple frosting. The best. Very helpful especially helping us get a locksmith for our locked car. Loved how clean the house was and how well arranged the layout was for a family union of 9. Our October weather during our stay was not ideal; but we felt very snug and comfortable in this home. Very satisfied with our experience. We live locally but wanted a special place for our visiting family. The Matterhorn was just right for our needs. Comfy, cozy, great lake views and set up just right. So responsive! Prior to the trip I had asked a few questions and each time I received a very fast and friendly reply! They even allowed us to do a drive by when there the month prior to checkout the driveway. This was important as it helped us understand we needed to bring the truck, not the car.